We were on a road trip back to Denver yesterday to cool off for a few months after broiling in Phoenix the last two months. We stopped outside of Gallup New Mexico for a quick lunch with the pups at a rest stop complete with shaded picnic shelters and only 91 degrees, almost chilly after the 122+ days in Phoenix last week.. They loved this new picnic concept and were stuck by our sides like a magnet once the Fritos came out! But soon it was time to go, we were headed to Santa Fe for the night, home of the hottest red chile sauce in the country. Within a half hour of our break, we were stuck in snail-crawling traffic wondering what was going on. We would find out later at dinner, that a semi had rolled over with hazardous materials after the driver had fallen asleep! What? Are you kidding me? How about making sure these drivers of the yucky stuff get some rest before heading out and dumping waste all over the highway? The pups had to potty but the cops weren’t allowing anyone to exit onto the side roads because they had also discovered a truck with two dead bodies at the exit ramp near the accident. Not at all related, just a bizarre coincidence that made the wait even longer while the “CIS” trucks made their way to the scene of the crime. There were two semi’s trying to help block people from racing around to the shoulders to better their position in the 3 1/2 hour queue, like they were going somewhere the rest of us weren’t. After hours and hours of inching our way forward, the pups were panting and whining to get out of the car. 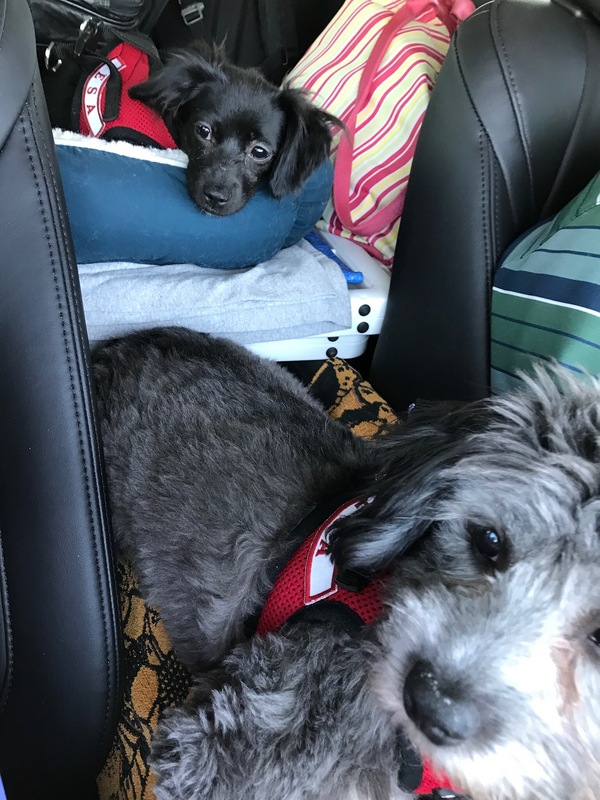 We finally threw on their leashes and Will carried them to the median of the normally traffic-whizzing highway, one at a time in the weeds and thistles. The two kind truckers kept everyone from going around us while we had our tiny dogs in the middle of the wide highway. Will ran around in circles trying to convince them to hurry up and not sniff for just once, and after the first puppy was finished, he threw him in the car at me like a football, grabbed the little girl, spun in circles again and hurridly jumped back in the car with a quick wave to the helpful truckers for keeping us safe from the crazy idiots that always need to move up a spot or two. I had yelled up at one of the guys, trying to get his attention to ask if he knew what was going in. He was listening to some tunes, not letting this distraction keep him from jammin’ down and dancing in his seat. He was making lemonade from those lemons we had all been handed as we made our way into Albuquerque, home of Breaking Bad. No wonder there were dead guys in a pickup truck along the highway. I felt like we were in the middle of an episode as we slowly passed by the multiple crime scene trucks almost four hours later. Welcome to New Mexico, home of Walter White.